Toilets Please for Dundonald Park (TP4DP) is research report undertaken for GottaGo! about the need for a public toilet in a busy park in the centre part of Ottawa by Kristina Ropke in 2015. Ropke surveyed 282 residents, both immediate neighbours and people from surrounding high rises. Over 80% were in favour of getting a toilet. For many seniors and low income people in the apartment buildings, the park was their only access to the outdoors, but they were prevented from spending time there by the lack of an accessible public toilet. The full report is available here TP4DP report. Flushing Inequality: a research project to assess the state of Ottawa’s municipally-funded toilets. (May 2016). A team of MSW students from Carleton University working with GottaGo! looked at a large sample of Ottawa toilets and found them sadly lacking. The City of Mebourne Public Toilet Plan 2008-2013. The Plan provides the framework to create a network of clean, safe, accessible public toilets in the City. The aims of the plan are ” To maintain a network of safe, accessible, clean and environmentally sustainable public toilets”. and ” To continuously improve the quality of the public toilet stock ensuring toilets are placed at locations that best meet community needs.” Public toilets are consdiered where privately operated toilets do not meet need. Washington, Kate. Before you go: How public toilets impact transit usage PSU Online Scholars Journal, vol 8, #1, Article 5. 2014. A study of the relationship between public toilet provision and transit use. The article provides many useful references to other studies in other cities, but found that, for Portland, a relationship could not be established as to many other factors were in play. TTC Week: Are more washrooms an urgent matter? by Jack Lakey. February 25, 2015. Toronto Star. A handsfree, self-cleaning bathroom for transit stations, by Eric Jaffe, in the Atlantic CityLab, February 17, 2015. “Atlanta believes it’s found an answer: a high-tech, hands-free, self-cleaning, vandal-resistant, loiter-proof bathroom built to address every mass transit agency concern and offer safe and sanitary service to the fare-paying public. This super-loo opened about a month ago in MARTA’s Lindbergh Center Station, with plans for a second in East Point Station. If the two pilots work well, they might just change the way transit agencies across the country view station bathrooms….Herrera calls the new model a big upgrade from the pre-fab automated public toilets used in the past. Those designs have been criticized as too costly—a July 2008 piece by Paige Williams in Atlanta magazine was headlined “Does This Smell Funny?”—but Herrera says you can’t make a good public toilet for any less than it cost to make Lindbergh. Both he and MARTA put the installation cost at about $100,000. Why Don’t American Subway Stations Have Public Bathrooms? The Atlantic City Lab January 13, 2013: An article on the limited number of open bathrooms on subway lines in New York, San Francisco, Washington DC. Although many have been closed because of operating costs and fear of terrorism since 2011, many are still open. The article enumerates how many are open in New York, San Francisco, Washington DC. San Francisco.In the process of reopening their subway toilets which were closed due to fears of terrorism after 9/11. BART may provide relief for riders by reopening bathrooms., San Francisco Chroncile, June 24, 2015. Article provides information on costs etc. Results of closure of many BART stations post -911. Australia: National Public Toilet Map. As part of the National Continence Program, the Toilet Map provides information on over 16,000 publicly available toilets across Australia, including accessibility, opening hours and facilities, such as showers & baby change areas. Downloadable as an app. The Great British Public Toilet Map. Interactive and Downloadable. Toilet Tube map: A map of public toilets in the Tube stations in London. Vancouver. A major debate is unfolding about public toilets on the Translink system. An article from The Province in July 2, 2014, highlights some of the key features of the debate. “Public toilets: Free and eco-friendly. Paris public toilets have been revamped. The city’s 400 automatic public toilets, designed by Patrick Jouin for the City of Paris and operated by Decaux, were redesigned in 2010 to make them safer, more comfortable to use, more hygienic and more eco-friendly. Each time the toilets are used, the toilet bowl and the floor are automatically cleaned, dried and disinfected. A manually operated emergency exit, which can be opened by firemen, for example, is accessible from the outside. Emergency lighting and a fire extinguisher have been installed to optimise safety. Comfort has also been enhanced. “The doors open and close automatically and the toilets are heated in winter and equipped with coat hangers, a mirror, a washbasin and even background music. In a move towards sustainable development, the new automatic toilet uses 30% less water than the previous model. The lighting is natural – it is supplied by a well of light placed on the roof. It is equipped with a motion sensor and therefore only works when the toilet is occupied. The entire electricity supply comes from renewable energy sources (wind, solar, hydraulic and biomass). 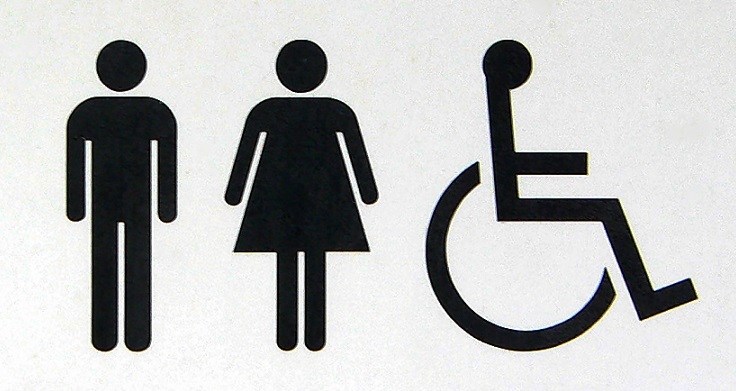 For persons with disabilities in Paris, a practical guide to free public toilets.